Released earlier this morning, Germany's factory orders increased for a third straight month defying expectations for a decline, and bringing back a little positive sentiment to German markets. The German DAX dropped 1.2% again yesterday amid confusion over the US-China trade truce and Brexit-related uncertainty weighing on markets. Looking ahead, traders might most likely stay on the sidelines today ahead of Friday's closely-watched monthly jobs report due tomorrow at 1315 GMT. Unable to hold its early session gains and stay above the 11265 support level, the bears took control yesterday ending the day €135 lower. 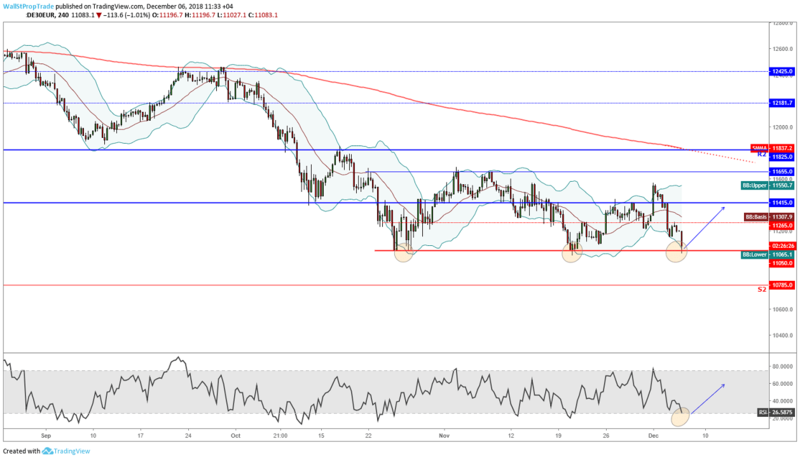 The ultimate key technical support level at 11055 is going to be tested today, and a bounce form these levels is highly likely as the RSI is indicates oversold conditions. With prices trading close to this year's low at 11009, however, downside momentum might speed up should the market break out to new lows for the year.